Formerly known as Top Tank, Mecca Bingo was launched back in 1961, and it is maintained by The Rank Group. The Mecca Bingo brand is considered as one of the largest bingo game operator in the UK. It includes numerous mobile apps and the popular MeccaBingo.com. For three years in a row since 2014, Mecca Bingo has won the much-coveted Bingo Operator of the Year honour at the International Gaming Awards. In 2016, they even bagged two awards at the EGR Innovation and Marketing Awards 2016 for Innovation in Bingo and Best Native App. As a household brand that has been trusted by bingo players for over 60 years, Mecca Bingo provides a safe, fun, and friendly environment for you to play. There is a great range promotions of promotions that new players can enjoy at Mecca Bingo. They include a generous first deposit bonus! 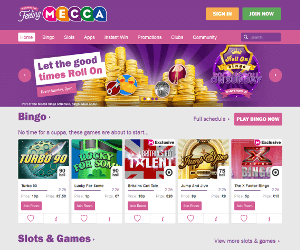 Simply join the site and spend £10 on the bingo games to receive not less than £40 as bingo bonus, plus another £10 extra that you can use in a Mecca club. Members of the Mecca Bingo can benefit from a wide array of promotions ranging from mobile prize draws to weekend jackpots. In addition to its huge range of promotions, Mecca Bingo also operates an all-inclusive loyalty program known as Mecca Treats. Here players can earn points for every bingo card they purchase. Climb the five levels of this scheme and enjoy different perks with each of them. Going the extra mile is what Mecca Bingo does best! When it comes to the game of online bingo, this site has over a dozen bingo rooms to offer you some of the best bingo variations. They have the standard bingo rooms offering 90, 80, and 75 ball bingo, along with great themed bingo rooms such as Dancing Queen, Deal or No Deal, and even Britain’s Got Talent. Apart from bingo, there are over 200 slots, casino and scratch card games to keep you entertained! Plus, there are also numerous mini-games that you can play directly from the bingo rooms.